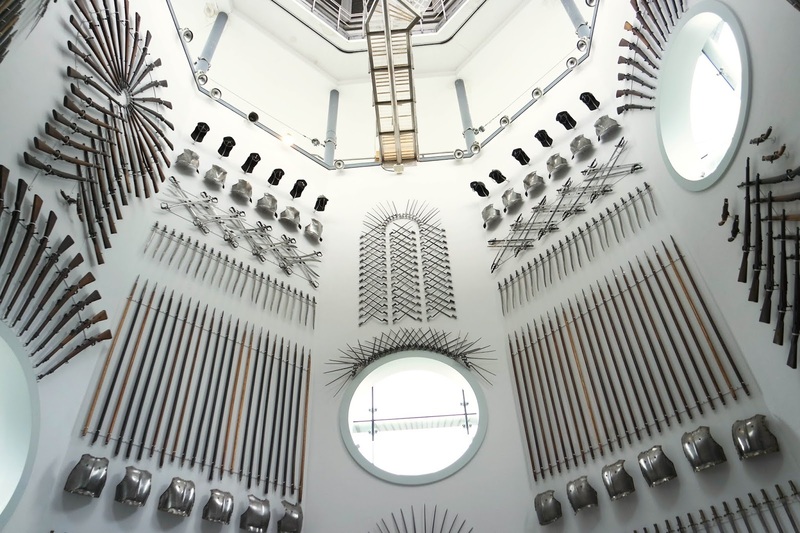 "Let's go to the Royal Armouries" they said. "It's not all armour, they've got a bit of everything!" they said. 'They' refers to my mother, and 'they' were very wrong, as I found out for myself when I visited the museum on Saturday. The museum is a few minutes from the motorway, right next to Leeds dock and just around the corner from an (expensive) car park. As we arrived there was a wetsuit-clad crowd preparing to dive into the canal itself as part of a triathlon- not something I would do on any Saturday morning, let alone a chilly September one! Luckily I could watch them through the museum cafe's floor to ceiling windows while I warmed up with a hot chocolate. Sufficiently sugar fuelled, we began to explore the museum. The first exhibit is possibly the most amazing of all, and a really innovative example of design. The staircase leading to the other floors wraps around a tunnel which is hung with hundreds of pieces of armour and weaponry on the inside. Directly beneath it is a sort of table with raised mirrors, each facet reflecting the artefacts above it. Climbing the stairs themselves, we reached a floor where we could see the pieces close up, read their descriptions, and find full suits of armour. It was at this point that I suddenly realised that these were real tools of wars and battles that had most likely injured or even killed real people, which was quite unsettling. There were such detailed, intricate designs, incredible engineering, and even examples of how swords were created hundreds of years ago, and it made me quite angry to think that humankind created weapons of torture and destruction before electricity, vehicles, and even vaccines. I appreciated that the museum made me think more deeply about what was in front of me, and visitor engagement was encouraged throughout. There were virtual reality helmets where you could see through the tiny eye slits of the helmets, and stations to watch and listen to films depicting battles. To further bring them to life, there was a wall hung with pieces like a bill, a mace, and a dagger, which triggered a knight to explain how they could hurt him when they were touched. Not only was this exciting for younger visitors, I liked that it was a good way for visitors with impaired vision to feel for themselves and hear a description. The sensory element continued through the use of light scents in certain exhibits, such as a cinnamon and clove fragrance in an area paying mention to the spice trade. Currently the museum puts the focus on a different legend each weekend, such as Mulan and Boudicca. This weekend was all about Arjuna the Warrior Prince, and children were invited to watch an animated film, create their own crowns, and watch a storytelling performance from a lady in traditional Indian dress. It wasn't a story I had heard as a child, so it was fantastic to see visitors of all backgrounds learning it, and of course it was a brilliant way to entertain the children. 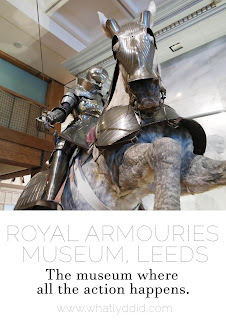 The Royal Armouries really does cover all areas, encompassing everything relating to armour under one roof. 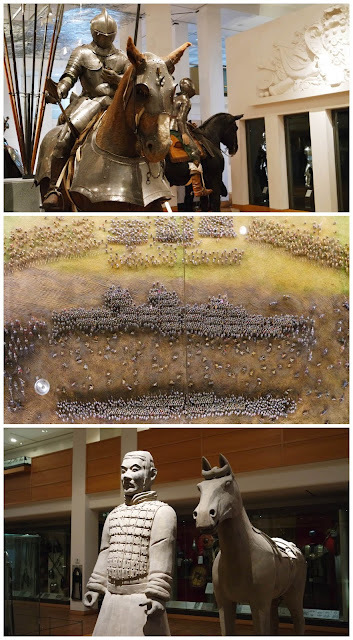 Aside from weapons and legends of the past, the museum touched on modern day, with exhibits for anti-war, including arms being made into art, crime and the battle against guns, and even a little case on the swords from Lord of The Rings! Despite every artefact relating to violence, I felt that the curators had done a really good job of presenting the information without making it upsetting or fearsome, which is further helped by the building itself being spacious and bright, and visitors speaking normally instead of in hushed museum tones. I hate to say this, because entry was free and I really do appreciate what the museum do, but by the end I was all armoured out and very, very bored. We were there for 4 hours, lunch included, and each sword and breastplate began to look the same. 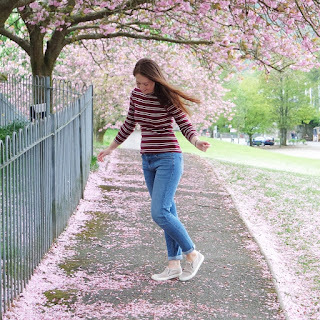 It's so worth a visit, but unless you are a huge history or battle buff, I'd suggest either taking a lunch break in one of the two cafes or picnic area, or skipping sections altogether. The only one I'm sad to have missed is the crossbow range, where, for a small charge, you can give the bows a go- a sure fire way to pack some action into your visit! 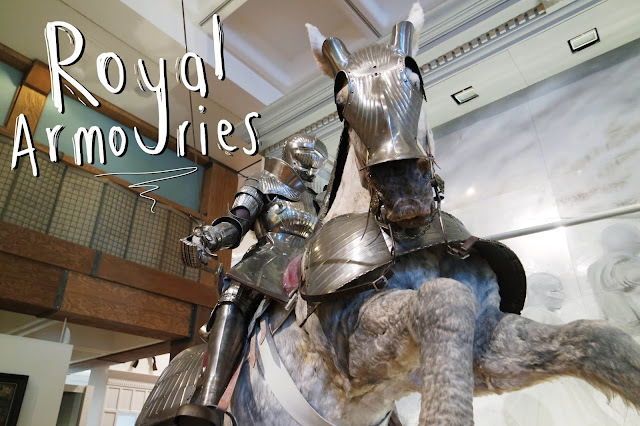 Would you visit Royal Armouries?